The only daughter of a prominent and prosperous family, Kate Freeman Clark was born in Holly Springs, Mississippi, a small railroad hub surrounded by cotton plantations located near the state’s northern border with Tennessee. Her widowed mother, Cary Ann Walthall Freeman Clark, was overly protective—chaperoning Kate everywhere, preventing her from establishing a studio of her own, and firmly discouraging her from selling her work. Nevertheless, the genteel Mrs. Clark saw that her daughter was well educated: at a fashionable New York City finishing school, at the Art Students League, and as a protégé of William Merritt Chase. When she began at the League in 1894, Clark studied watercolor with Irving Wiles, a noted portraitist, and drawing with John Twachtman, a Connecticut Impressionist recognized for his evocative snowscapes. Watercolor, a medium frequently employed by women and one that is less likely to soil clothes than oil, may have appealed to Clark’s need for tidiness. But once she saw Chase—dressed in a smart white flannel suit—neatly demonstrate his painting method, she converted to oil. 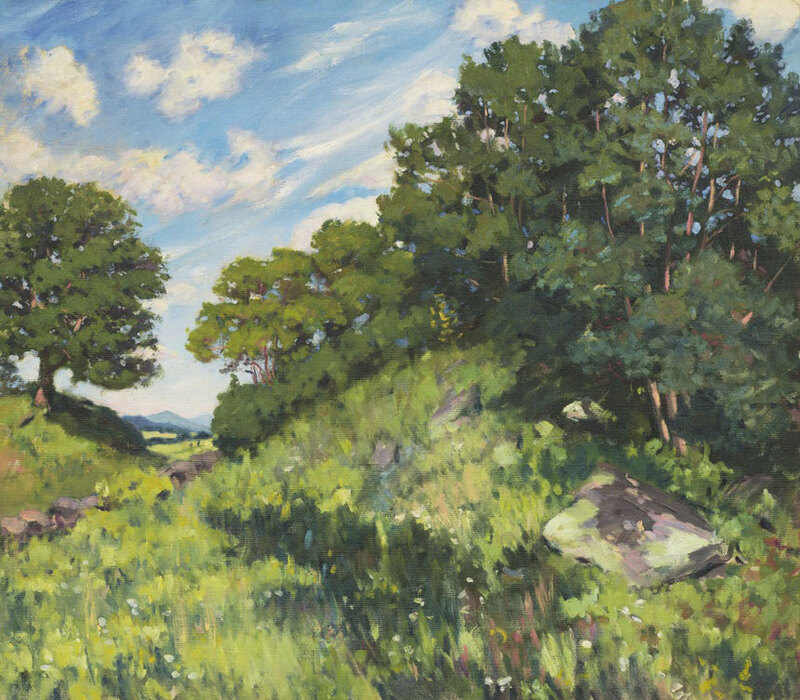 Clark spent the summer of 1895 at Peconic, Long Island, enrolled in Wiles’ outdoor painting course, and then switched her allegiance that fall to the Chase School of Art (later the New York School of Art). Under Chase’s tutelage, Clark painted earth-toned figure studies and still lifes, as well as plein air landscapes. Between 1896 and 1901, Clark routinely attended Chase’s Shinnecock Summer School of Art. Located slightly west of Southampton on Long Island, the program usually attracted as many as one hundred students, mostly women, who—dressed in long skirts, white blouses, and bonnets—were encouraged to work outdoors, a practice enhanced by Long Island’s bright sunlight. By 1903, Clark suspended her formal studies and, at Chase’s urging, attempted to establish her own stylistic identity. She spent summers away from New York City in pleasant settings where she nurtured her forte in plein air scenes. From 1904 until 1917, Clark regularly exhibited her paintings at the National Academy of Design, electing to conceal her gender by signing her canvases and listing herself as “Freeman Clark.” When Chase died unexpectedly in October 1916, Clark was devastated. The deaths of her maternal grandmother and mother followed not long afterwards. Very much at a loss without these three anchors, Clark retreated to Holly Springs in 1923, where she spent the remainder of her life, never painting again. In her will, she left the entirety of her oeuvre—about one thousand objects that had been stored in New York—to her hometown with instructions to build a museum to display her paintings and family archives. Clark’s work is also represented in the collections of the Memphis Brooks Museum of Art and the Greenville County (SC) Museum of Art.